The Fabricator (or Builders') Series continues to be one of MR Direct's most popular lines of stainless steel sinks. Each fabricator sink has identical overall dimensions of 32 ¼" x 18". Despite the equivalent sizes, fabricator sinks are available in various styles, including equal-sized bowls, offset bowls, and single basins. Each fabricator sink is an undermount model, positioned below the surface of the counter, so the edge of the countertop is exposed. The Fabricator Series makes it easy for builders to stock up on various models and pre-cut a 32 ¼" x 18" hole in the countertop. This provides customers a variety of sinks and ample time to make important decisions without interrupting workflow. 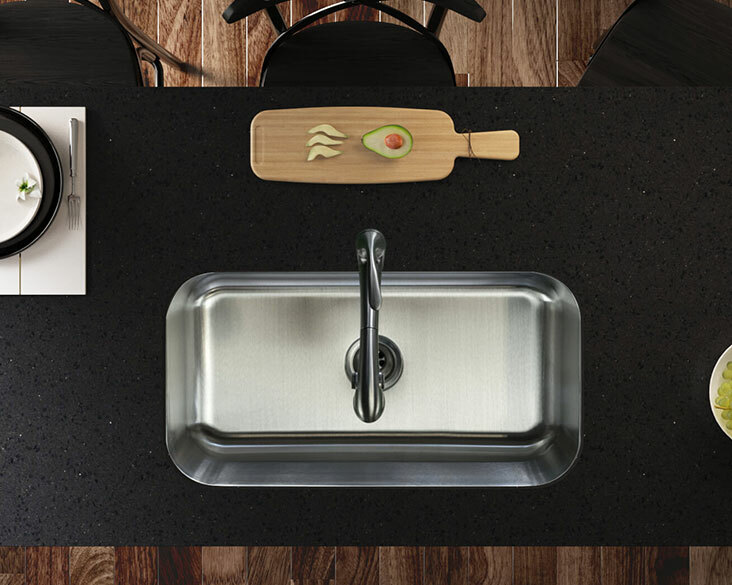 MR Direct Fabricator Series stainless steel sinks are constructed from cold-rolled 304-grade stainless steel. The superior-quality composition and corrosion-resistant properties ensure a strong product that you can depend on. Each sink comes fully-insulated to diminish sound, and has a brushed satin finish to help conceal any scratches that may occur over time. To clean your sink after everyday use, it's important to rinse with water and towel dry afterwards. Most cleaners contain chemical additives that will compromise the luster of your sink if they are used daily, but regularly rinsing with water is sufficient. Once a week, saturate your sink with a mild abrasive cleaner and use a soft cloth or sponge to scrub with the grain of the sink. Rinse immediately and towel dry. Never use steel wool or allow chlorides to remain in contact with your sink for long periods of time.